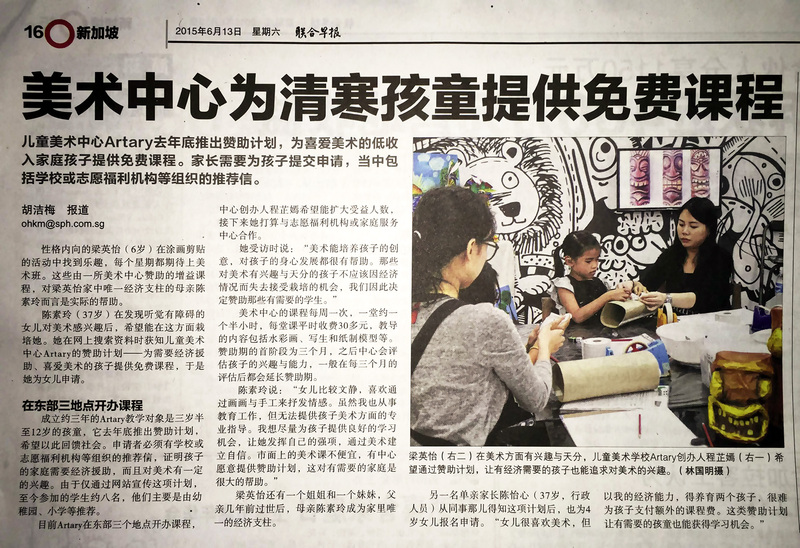 Artary’s Art Starts Programme was recently covered by 联合早报. Learn more about Art Starts. Article has been translated to English for non-Chinese readers. Children’s art studio Artary launched a sponsorship programme in 2014 for children from low-income families who show keen interest in art. Parents need to apply with a recommendation letter from their child’s school or volunteer welfare organisation (VWO). Quiet and reserved Abby-Faith Leong (6 years old), who seeks joy through making art, looks forward to her art classes every week. To Abby-Faith’s mother and sole breadwinner, Ms Kimmy Tan, Artary’s sponsorship provides her daughter with the assistance she needs. When Ms Tan (37 years old) discovered that her daughter, who suffers from hearing difficulties, had a keen interest in arts, she sought to develop her interest. It was while researching on the Internet that she learnt about Artary’s Art Starts – a sponsorship programme for financially needy children with keen interest in art. That is when she wrote in for her daughter to be admitted into the programme. Artary, whose art training programmes are catered for children aged 3.5 to 12 years old, launched the sponsorship programme in 2014 in hope to contribute back to the society. Applicants need to be recommended by their schools, VWOs, or social and welfare organisations to verify that they are on a financial assistance scheme, and have displayed a keen interest in art. By offering the programme mainly from their website, Artary’s sponsorship has reached out to 8 students, mostly who have been recommended directly through their kindergartens and primary schools. Artary currently operates from three locations in the East. Founder Ms Vanessa Seng wishes to reach out to more beneficiary students by working and establishing partnerships with VWOs and family services centres. “Art can develop a child’s creativity, and is very helpful to their holistic development. Children who are interested and talented in art should not be denied the opportunity to nurture themselves due to financial circumstances. That is why we decided to sponsor needy students.” said Ms Seng in an interview. Artary’s programmes run weekly sessions of 90 minutes each, with each class costing more than 30 dollars. The programmes cover watercolours, still life and papier-mâché among other topics. After the initial sponsorship of 3 months, the studio will review the child’s interest and abilities. Majority of the students have had their sponsorships extended after the review. “Abby-Faith is a quiet girl who loves to express her emotions through art and crafts. Even though I am working in the education sector, I cannot provide her with professional guidance in art. I want to do my best to provide good learning opportunities for her, so that she can discover and showcase her talents, and to develop a self-confidence through art. The art classes available in the market are quite expensive. A studio that provides such sponsorship programmes will really help many needy families.” said Ms Tan. Abby-Faith has an elder and younger sister. Since her father’s passing a few years ago, her mother has been the family’s sole breadwinner. Another beneficiary, Ms Talia Tan (37 years old, administration worker), also sent in her application for her 4 year old daughter upon learning about the Art Starts programme from her colleagues. “My daughter loves art and crafts. Given my financial situation, and the need to bring up my two children, it is very difficult to pay for enrichment classes. Such sponsorship programmes provide needy children with the learning opportunities they need.” said Ms Tan. Photo inset: Abby-Faith Leong (2nd from right) has keen interest and talent in art. Artary’s founder Ms Vanessa Seng (right) hopes to help children from low-income families to pursue their interest in art.